Perrysburg, Ohio (Jan. 27, 2013) - Owens-Illinois, Inc.(NYSE: OI), the world's largest glass container manufacturer and preferred partner for many of the world's leading food and beverage brands, has unveiled a new glass packaging for Colombian-based Fabrica de Licores de Antioquia (FLA). 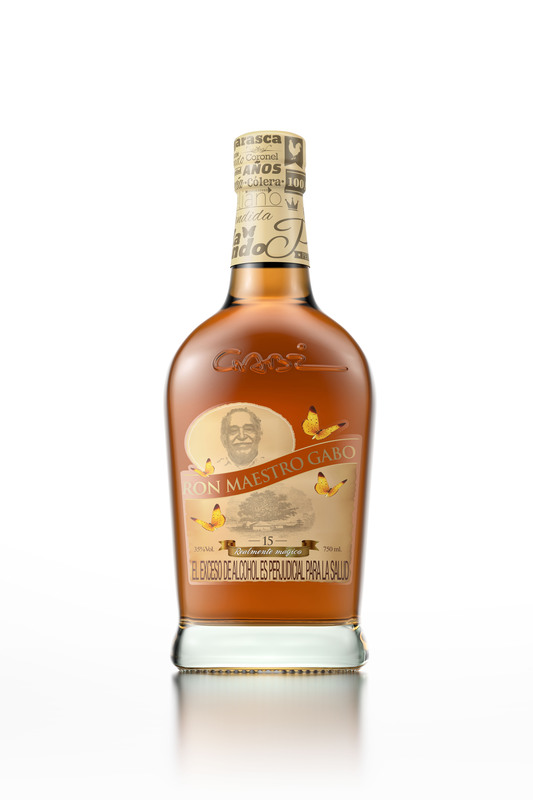 The limited-edition super premium rum has been released under FLA's Ron Maestro collection and pays homage to Colombian writer and Nobel laureate Gabriel García Márquez, also known as 'Gabo.' Ron Maestro Gabo Special Reserve marks O-I's second arts-inspired partnership with FLA since 2012. Ron Maestro Gabo packaging is a result of strong collaboration between FLA and O-I's Covet(TM) team. This special spirit is packaged in a glass bottle from O-I's Covet Classics(TM) line. Working together, the bottle and the decoration capture the magic of Gabo' works and celebrate the unique flavors of FLA's spirit. The label features Gabo's face surrounded by the titles of his various literary works and a number of colorful butterflies, a reference to a character from the "One Hundred Years of Solitude" who was always surrounded by yellow butterflies. The bottle is produced at O-I's manufacturing facility in Soacha, Colombia. "We are thrilled to collaborate with FLA yet again," said Gabriel Sanchez, director of Covet(TM), O-I Latin America. "By leveraging our Covet(TM) designs for Ron Maestro Gabo, this new bottle fully captures the essence of the spirit as well as the heritage and legacy of Gabo that FLA desired." Ron Maestro Gabo Special Reserve was created by a panel of expert spirits tasters who worked for more than six months to achieve a unique blend of 30-, 17- and 12-year vintage rums from FLA's aging cellars for a flavor profile that would be deserving of the internationally-recognized author. The spirit is currently available in limited quantities in Colombia. For more information on Master Ron Gabo, FLA and O-I's Covet(TM) Classics Line, visit www.o-i.com. Covet(TM) is a collection of luxury glass packaging products and related services that help super premium brands achieve their business objectives and deepen their connections with consumers. Covet brings the best of O-I's global capabilities, including custom glass design and decoration, a collection of classic O-I bottle designs and O-I's innovation portfolio to help high-end brands seize market opportunities. Owens-Illinois, Inc. (NYSE: OI) is the world's largest glass container manufacturer and preferred partner for many of the world's leading food and beverage brands. With revenues of $7.0 billion in 2012, the Company is headquartered in Perrysburg, Ohio, USA, and employs approximately 22,500 people at 79 plants in 21 countries. O-I delivers safe, sustainable, pure, iconic, brand-building glass packaging to a growing global marketplace. O-I's Glass Is Life(TM) movement promotes the widespread benefits of glass packaging in key markets around the globe. For more information, visit www.o-i.com or www.glassislife.com.